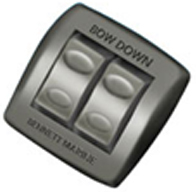 This Bennett control is waterproof, and ergonomically designed. Fits in a single 2-1/2" hole. Measures 2-3/4"x2-3/4" and retro-fits with existing Bennett controls.